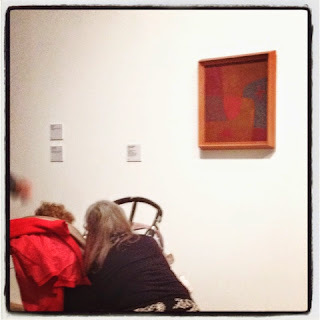 A few weeks ago we went to the blockbuster Paul Klee exhibition at the Tate Modern before it closed. It had been recommended by a number of friends, but they were unsure whether it would suit the Culturebabies as many of the paintings are quite small, and unlike Hirst, Kusama, Gaba, Sensing Spaces etc... each so multi-sensory, and therefore hugely successful for little ones, this exhibition did not provide the same tactile opportunities. However, many of Klee's works are bright, colourful, bold, and have childlike qualities. He was inspired by nature, animals and music and included these in his art (alongside letters and numbers) - all perfect for I-spy. 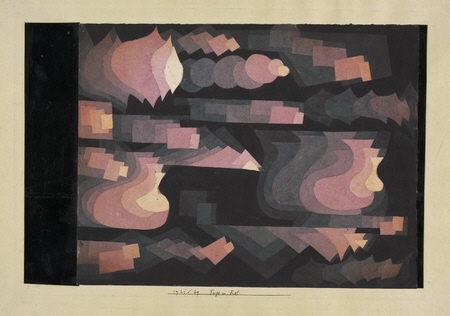 Many of Klee's best known paintings are primarily colours and shapes. He thought that just as a baby babbles before she can speak, an artist should paint from their innermost source, whether or not these paintings are ultimately understood. He watched his two year old son Felix paint and he thought many of these productions were better than his own and believed that he could learn a lot from children. He particularly admired Kandisky's art for its primitive and childlike qualities and Franz Marc's work for its colour and imagination. He believed that people could be changed by the art around them and was in love with colour. He said "Colour has got me...It has got me forever, I know it. This is the meaning of this happy moment: colour and I are one. I am a painter." Culturebaby, at a little under two and a half, now benefits from some research and preparation before exhibitions and trips. It isn't always enough to walk around and show her the art, especially in an exhibition where she cannot touch things. She gets a lot more out of the experience with a few activities, which can be very simple but help her to engage or consider the art in tactile ways or in conversation. We began by looking at a couple of paintings which caught her eye. One in particular depicted a blue moon. This was very much like an illustration from her fabulous book "Miffy at the Gallery", which currently comes to the Tate Modern with us (for our review see here). We fished it out and read it in front of the painting. 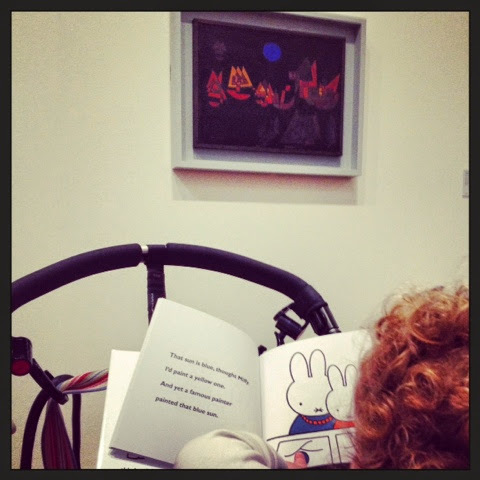 She enjoyed comparing the picture with the illustration in the book - and I'm sure Klee himself would approve of the blue sun which Miffy ponders as a work which shows nature not as it really is, but as it could be in the imagination. All in all though this was one of her crankier gallery trips (she was tired as it was the afternoon) and she uncharacteristically wanted to sit in the pram. I wondered if we were too late to catch her in the right mood, and I feared we'd end up being THAT family. You know, the one with the toddler either rolling around in the middle of a doorway or careering around only interested in knocking over flimsy barriers with parent chasing and baby crying? I'm sure we've all at times been THAT family. With this in mind we moved more quickly through the exhibition and wondered whether to leave it for the day, however, happily the tantrum never came to pass. It was amazing that as she settled down with CultureGrandma for a simple activity, Culturebaby suddenly became alive and engaged. We had prepared a simple line drawing from the Paul Klee colouring book I mention below and a small packet of crayons. She concentrated for a good while on colouring in sections of the page and looking at Klee's original in front of her. I'm learning that sometimes, depending on her mood, it is more worthwhile focussing properly on one or two works than on many. As a tired mummy of two, with a toddler to entertain, I sometimes inadvertently forget about planning specific activities for my happy little 4 month old Culturetot. She goes with the flow and loves watching her sister. However, the greatest triumph and surprise of the day was how much she loved the exhibition. She babbled and bounced and really concentrated on a number of the paintings with their fabulous colours and bold shapes. 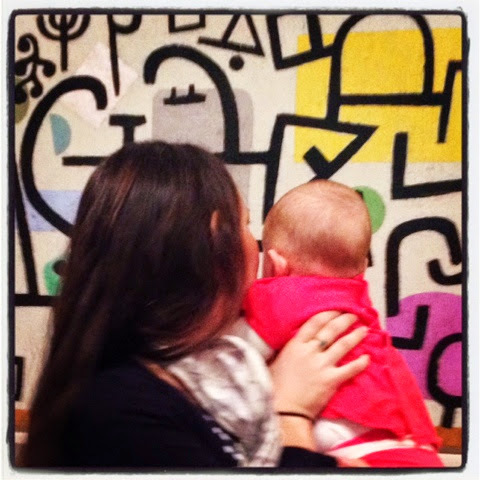 I was happily reminded of how Culturebaby also reacted to art two years ago when I began this blog, believing as I still do that it really is never too early to introduce babies to art. The Cat and The Bird by Geraldine Elschner and Peggy Nille - This STUNNING story book is inspired by Paul Klee's painting of that name. 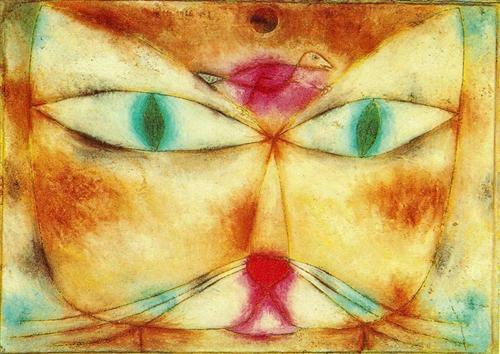 The illustrations all evoke Klee's style and feature his imprisoned cat who longs to be as free as the bird it desires beyond the window. It convinces the bird to help it in exchange for its safety. Despite the fact that the language is at times seemingly complex for her age, the simple storyline with its moral message of friendship and bright images was a really big hit with two year old Culturebaby. We have read the book over and over before and after our trip to see Klee, and though the painting unfortunately didn't feature in the exhibition, it was a wonderful introduction to the artist's style. The final two pages also contain some great information about Paul Klee and his interests. Paul Klee Colouring Book by Prestel - This extremely high quality activity book is a dream for any parent who wants to offer tactile ways to engage with Klee's work. It invites children to colour or complete images, draw from their own imagination alongside Klee's sketches, answer questions about what they see in the art, make a mobile and even use Klee's Fugue in Red as inspiration to draw their own favourite song. Many of these tasks are, as yet, too old for Culturebaby, but the activity I mentioned above with the simple colouring of sections of a line drawing of Klee's Angel in the Making was taken from this book. I know I'll be using this brilliant publication for years in different ways and can't wait to discover others in the series. Paul Klee for Children by Silke Vry - This wonderful book was such a brilliant surprise. From the cover it looks lovely, but its fairly unremarkable exterior betrays perhaps one of the most inspiring art appreciation books for children I have encountered. Once I opened it I couldn't put it down, and as an adult I learned a good deal from it too. Although designed for older children to work through, learn facts about Klee and do a whole range of creative activities from trying out his style of art using potato printing and spray paint, to cooking and drawing self portraits with their eyes closed, this book contains inspiration for parents with the youngest of tots. 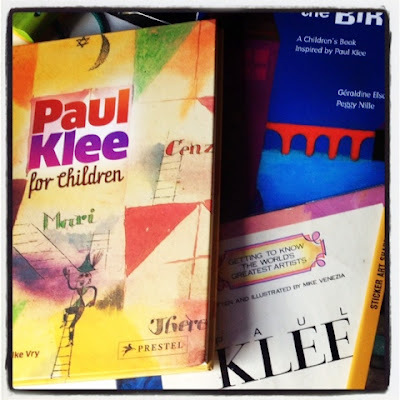 It also includes many really fascinating details of Klee's life that are just the sort of things a parent could remember and share with a toddler. 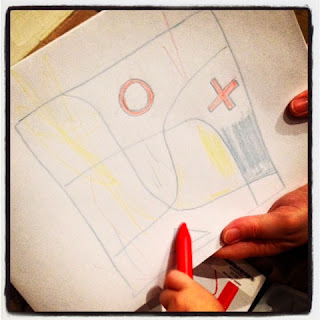 I believe this book will last in our household for years and I couldn't recommend it more highly as a mine for parents to learn about Klee and design age appropriate activities. A few years ago my champion charity shopping mother picked up a few titles from Mike Venezia's fun series "Getting to Know the World's Greatest Artists". Happily a title on Paul Klee was amongst these. Using simple language, choice facts and a combination of fun cartoons and original prints of the art, these books are a really good introduction for young children. Whilst these are still a little old for Culturebaby at present, I think in another year we could easily read these together. Finally, I couldn't tear myself away from the exhibition without a copy of Paul Klee's Sticker Art Shapes. There is little that excites my two year old more than sticker books. If I handed this to her I would no doubt be peeling fragments of Klee's paintings off our furniture for weeks. I've resisted. It is too old for her at present and if done properly requires rather a sophisticated attention to detail. I'm saving it for the future. It was his Grandma who first taught him to use colouring pencils and helped him to love creating art for the first time. She never criticised his work and always found something positive to say about it. And here are 10 simple, toddler-friendly Klee-inspired activities we will be trying in the future. A number of these come from Klee for Children. 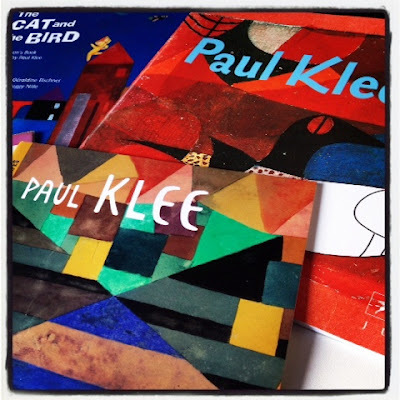 We'd love to hear about your Klee inspired projects too. 10. Colouring in sheets from our Klee Colouring book. Disclaimer: We received copies of the three books from Prestel Publishing for review purposes but as always my opinions on them are entirely my own. Reproductions of paintings are from Wikipaintings and are included here under fair use principles.